In the Hebrew Bible reading we hear the story of the birth of the prophet Samuel, on whom the guidance and direction of Israel waits. In distress because of her barrenness, Hannah makes fervent intercession before the Lord, pleading for a male child and promising that should her hope be granted, the child will be set aside for the Lord’s service. The priest Eli at first thinks Hannah is drunk, but when he perceives her faithfulness, prophesies that the Lord will fulfill her petition. Against all expectation, Hannah becomes pregnant and delivers Samuel, who will become a nazarite, a prophet and a great judge over Israel. 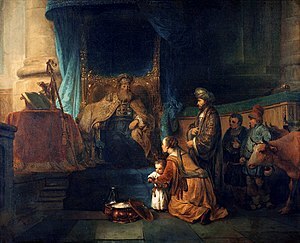 The Song of Hannah continues Samuel’s mother’s rejoicing. Our New Testament reading from Hebrews also confirms what has been promised to God’s people. God’s eternal law is now inscribed on human hearts and minds. Believers who have been washed in baptism must continue in the faithful way, encouraging each other to love, good deeds and frequent assembly. While our Gospel may speak of death and destruction, it too is a symbol of hope in the future. There will be wars, earthquakes, and famine – common end-time imagery. And certainly images we see in our news and in the world today. But just as birth pains indicate that a child is about to be born (Advent will soon be here! ), so these startling events are to be signals of the coming Kingdom. What is your initial reaction to today’s Gospel reading on the destruction of the temple? Why do you think this bleak scenario is included in the Lectionary as we draw near the season of Advent? Which of the several images that will mark the beginning of the end of time do you find most compelling? Why? What is the Good News for us in today’s readings? What hopes and expectations can the Church bring to the world around us at this time, especially in the aftermath of natural disasters, continued unrest in the Middle East, and gun violence in our country? This entry was posted in Advent, Ordinary Time and tagged Epistle to the Hebrews, Gospel of Mark, Hannah, Israel, Samuel, violence. Bookmark the permalink.